Since blogging started becoming the next big thing, years ago, more and more designers from all aspects of the industry have started, phrase by phrase, paragraph by paragraph, post by post, becoming seduced by it. Sharing their thoughts, ideas, knowledge about their respective fields, they connect every day with people all over the world with whom otherwise there would be no contact whatsoever. 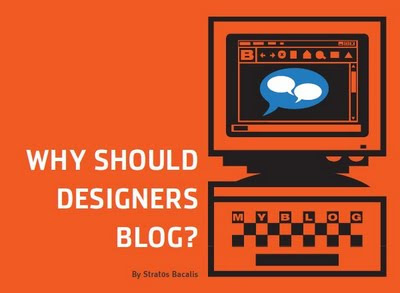 Should a designer blog then? How can it be possible for people that are so creative in their work, to step aside for a moment (or hours in many cases) and delve into a previously unknown world to them, the one of creative writing? Keeping a blog is no mean deal – if it is for serious, that is. It is not merely a personal diary, especially for a professional who will centre it on his métier. Is it worth all those hours spent in front of a screen, but instead of designing, say, the perfect chair, writing about designing one? Holly Becker, the famous Decor8 blogger , who is a writer and interior design consultant, seems to think it does. “I think designers should blog because clients enjoy having access to them day and night - they are able to gain insight into your inspirations and ideas 24 hours a day, 7 days a week”, she says. ”It also helps them to learn more about your personality and to deepen their relationship with you. They can view links, shops and other things that you highlight so that they can learn more about the things that you find as a designer. Interior design should not be some mystery society in my opinion; I enjoy sharing what I find with all who visit my site. I believe everyone should have access to good design!” . Increased exposure seems to be a major advantage of blogging for a designer. Making him stand out between his colleagues, a designer’s blog helps him reach out to an international audience, reach people from all kinds of professions and fields and make his ideas and work known to places that otherwise he could never reach, or have to spend a huge amount of money doing so. That of course leads to another bonus: name recognition. Decor8 had 16 readers when it opened, most of them Holly’s clients. Now she has over 25,000 daily readers and one of the most popular design blogs in the world. The learning experience is another aspect of blogging. Writing about one’s designs and inspiration leads the designer to further solidify his/her personal style and tastes, find out what he/she likes or dislikes in a more precise way, and have the archive to shift through whenever one feels like it. It also helps the designer become more aware of his personal style. The obvious reason to blog of course would be networking. Getting in touch with colleagues, possible collaborators and clients from all over the world is a tempting option for the designer/blogger. Richard Haines, illustrator for In Style magazine, J Crew and 5 star luxury hotels. is wondering why not most fashion designers don’t have their own blogs, especially the more famous ones. And having such an immediate and easy way of communicating between them, it makes realizing projects that much easier. It also provides an easy access to the designer for his clients, who can comment on their projects without spending time on time-consuming telephone calls from a city 500 km away. The instant feedback one gets on his work through the blog is as valuable a tool as any. Writing also improves the designer’s communication skills, in writing and otherwise, while at the same time providing a nice variety and distraction from a routine workload. The blog also can be a pivotal component of an official website, which is the more traditional means of an online presence. It improves the site content for search engines, gets more indexed pages, provides fresh and updated content frequently and also feeds the internet with keywords and phrases that lead straight to the designer and his work when one looks for it on-line. Writing about one’s respective field also demonstrates his knowledge about it, which of course is another way of promoting oneself. It also provides potential promotion opportunities, as the designers can post their upcoming projects or exhibitions or events and make them known to a wider audience. In combination with social networking sites, this can be a powerful advertising tool with minimum cost. Is it worth then to steal some time from honing one’s talent, perfecting one’s work, to deal with the hassles and travails of blogging? The answer is yes and I am particularly surprised that more designers have not yet caught up with it: they would be pleasantly surprised with the results. This article was written for and published in issue 14 of the South African DESIGN> Magazine. I saw Richard H underlined and I thought it wss Richard Hawley, ha haa!! @meteoritis-heard it today and enjoyed it!